Using its unique and powerful NLP algorithms, TipRanks tracks an incredible 37,000 corporate insiders, monitoring their transactions and calculating which transactions have been profitable. Take investment inspiration from profitable insider transactions to generate the highest investment returns. But you don’t have to track all 37,000 insiders. TipRanks has done this for you. With TipRanks you can follow the activity of just the top 25 corporate insiders. 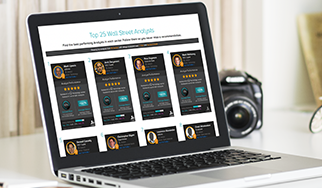 TipRanks rates and ranks insiders by their profitable transaction rate and average return so you can find the very best insiders to track for investment ideas. Let’s begin by setting the appropriate ranking parameters for your investment strategy. Shorter term investor? You can measure the performance of each rating since January 2009 for just one month. Longer term investor? Select the one or two-year time period. Next choose the appropriate benchmark by which to rank the insider, the S&P for example or the insider’s sector. 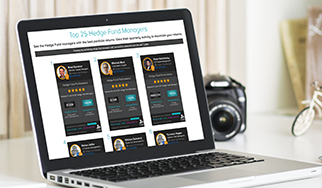 The result: the top 25 insiders that best match your investment requirements. 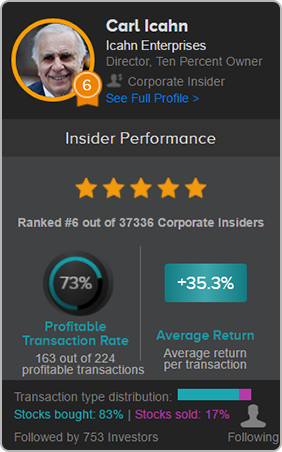 Check out the insider’s performance rating, name, company, position. You can also see their transaction type distribution- whether they mainly buy or sell shares. And that’s it. Here for example we can see that at the time of writing the no.6 corporate insider on TipRanks is Carl Icahn who is an owner and director at Icahn Enterprises and CVR Energy among other companies. He has a very impressive 73% profitable transaction rate (i.e. 163 out of 224 of his transactions have been profitable) and 35.3% average return per transaction- 83% of which have been stock purchases. Click on the insider’s ‘see full profile’ link to explore their recent transactions and get inspired. Ready to start? Have a question about the TipRanks Top 25 Insiders?